This is a great link, for finding alot of info, audio lessons, testimonials, written content on the Big Picture. This content was created by Brent Hunter, a successful evangelist, who applies the first century principles of reproduction in soul saving. 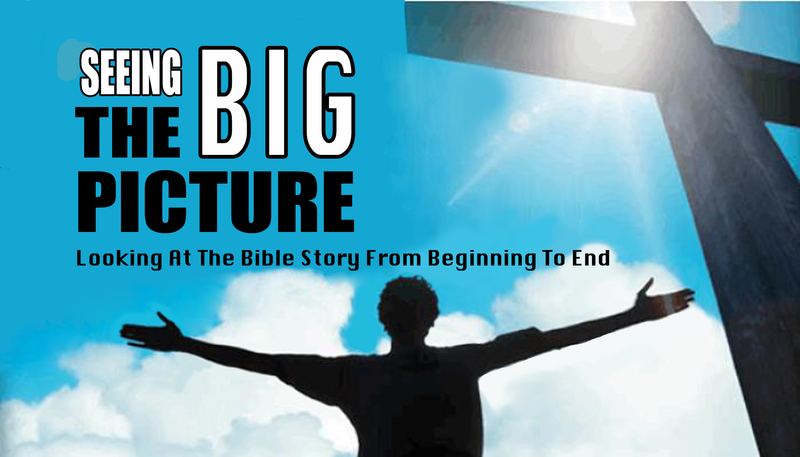 Big Picture Details: For teaching others and for learning to present the content. With the "How To" Guide and Materials page being utilized, the Class should take just a few weeks. Be practicing oral delivery in small groups of two. This will encourage comfort in interacting in presentation and increase verbal endurance, with a number of students at the same time. They can present it in small (time) portions, back and forth till they build up oral speaking endurance and familiarity. Example: mini group rotates reading the presentation, beginning where each student left of, rotating every 15 minutes, or 30 minutes. Also have students take home cheat sheet flip chart or give online cheat sheet file (See file below,) for them to read over and practice orally at least once a week, for familiarity and build up oral delivery comfort, (let them know they can take breaks every 15 or 30 minutes till oral endurance is build up. The goal is gaining familiarity and presentation delivery comfort while building up to oral/1 hour endurance of the Big Picture). Once done, each student should have a cheat sheet flip chart given to them, who then should be exhorted to share with friends, family, neighbors, etc. Besides sharing this content by the above examples, the students can share the Big Picture in every day situations, such as when they develop a rapport with someone, in a social setting like at a waitress at a restaurant, a cashier at a grocery store, a old hair salon friend, a college teacher, folks at a (wholesome) party the student is talking too, etc. Flea markets, college booths, mall stands, festival or fair ground stands, presenting to fellow Big Picture students in public places, like Starbucks, even door knocking, are just some ways to share this content as well. Give a time frame for when the class will be done and group sharing projects will begin. About a month. This put's pressure on the Students to be ready before the due date and makes them more likely to do the exercises outside of class. IT takes about 8 times going over the content to get familiarized with it. So for classes and asking the students to go over the one hour presentation in reading, or better yet in speaking out loud once a week, will have them ready in a months time. If they miss a class, ask them to do the exercise twice the following week to catch up. Emphasis and stress the importance of having the content gone over at least 8 times, before the months end to be ready. Doing this as a church class on Sunday's and Wednesdays, would of course make this easier. But for those at home classes the above works. Again: Once you feel like your ready practice giving the Big Picture presentation without reading the notes on the back, by just looking at the graphic's to explain each chart. Don't want to be co-dependent on the note cards. Took me 8 times to become ready to do this.. Optional: Also accountability check lists. You can use this to see the students progress, and can say that's why when sharing this tool. But it also will make the students more accountable, and will help the teacher see if they are doing the exercises at home or not. I'd suggest "Google Forms" and you can send the check list out each week by email to the group. Here is an example, you can use. Click here. This with encouragement and praise will go a long way. Questionnaire "How where you saved?" ​Always good to have them fill this out before presentation. Sometimes people will say they were baptized, as an auto response, even if they were not. So having them write down, "Sinner's prayer," etc, simplifies things. ​and getting the card back for reaching them with the info given. These are great for studies, mailing, and even making into a stapled booklet for training others. Smooth segue way after invitation and further contact after presentation, if the answer to the presentation is a "maybe" or "no" as a response. See/watch others present the Big Picture to get more familiar with this delivery. Also listen to Brent Hunter's Big Picture presentation.